So for my first real blog post about my camera obsession, I figured I should start with my favorite company, Polaroid, and, since this is the first post, why not start with the company's first camera? Logical, no? For those of you who have lived under a rock your entire life or are just too young to have experienced the Polaroid craze, here is a little background information. A Polaroid is special because it is an instant camera. This means that once a picture was taken it was either ejected or pulled out of the camera causing development of the photo almost instantly (over the years development times have ranged from 10 seconds to 3 minutes). 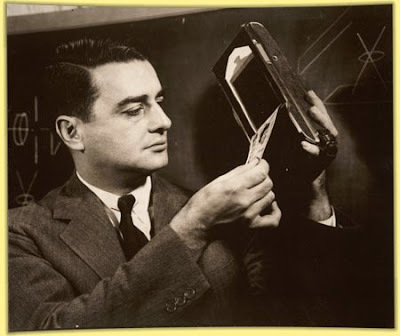 The process was developed in the 1940s by Dr. Edwin Land who, prompted by his daughter, sought to create a solution that allowed photographers to see their pictures instantly rather then having to send film away to be developed. Once known for creating polarized lenses, sunglasses, 3D glasses, and military goggles, the company refocused mainly on Land's new invention, many of which were marketed as Polaroid "Land" Cameras. The Polaroid was once a very popular choice for families, often being the main camera in many households. The popularity of the instant camera was at it's highest from the 1960s through the 1990s, but sadly digital photography came along, proving to be more instant for the newer generations since they could see a digital image instantly on a screen rather than waiting for a sheet of analog film to develop. In 2008 the company discontinued all forms of its instant cameras and films, but due to the widespread outrage and demand for the resurrection of the format, Polaroid has released a new (despite being meager and pricey) camera that still utilizes instant film. Fujifilm and The Impossible Project currently produce films that can be used in many of the company's fantastic older cameras, and an instant line of cameras known as Instax is also being marketed by Fuji. Despite these option, nothing beats a classic Polaroid. Anyways, there's your background. Now onto the camera for this post! Polaroid's first camera was called the "Model 95" and was released in 1948, originally selling for $89.75. Almost one million of these cameras were produced between 1948 and 1953 when production ceased. The camera featured a pop up view finder and a connector for a flash that could be mounted in the accessory shoe on the top of the camera and used Press 25 or #5 flashbulbs. A variety of exposure meters, carrying cases, and other accessories were also available for purchase alongside the camera. All examples of this model were metal and were covered in a brown, leathery material. 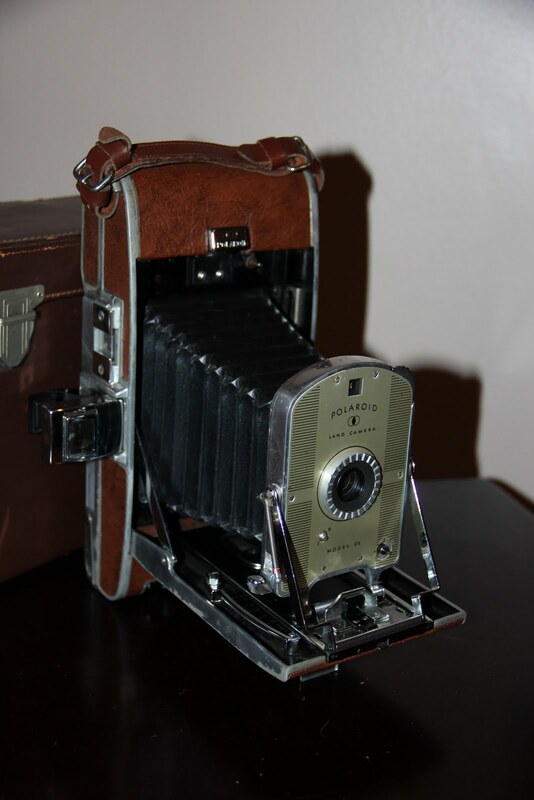 Early Polaroid cameras were fairly large and heavy, utilizing what became know as Type 40 roll film. In this film series, two rolls were inserted in the camera, one made up of a negative material that was exposed, and the other with the final photo papers and pods containing the developing chemicals. One who have to press a button the rear of the camera releasing the film after a picture was taken and pull the paper tab sticking out of the end of the camera. This pulled the negative and positive papers together between two rollers that spread the developing material. After waiting the instructed development time, the user would open a door in the rear of the camera and peel the picture off of the negative, which then needed coated to make the image last without fading. Originally released with the camera in 1948, Type 40 film was quickly replaced by Type 41 due to stability issues. Other improved films were later released, the most popular of which included Type 42 and Type 47, the first 3000 speed film. The last of these were discontinued in 1992 making the Model 95 and all other Polaroid roll film cameras obsolete. I own two of these cameras in my own personal collection, one that I purchase in 2005 on eBay for 99 cents, and the one pictured, which was a gift from my grandmother this past Christmas. I have always loved this particular camera for its historical value and the legacy it created, a legacy that spanned 60 years, and is now seeing a revival due to the wonderful people who refuse to let it die. And there you have it, the end of my first post. Sorry about how long and wordy it was, but I felt it necessary to provide some first time background knowledge about the company and the camera. For more information you can look some of my favorite sources including http://www.rwhirled.com/landlist/landhome.htm as well as google-ing more information on the camera or the corporation. Thank you so much for taking the time to read my blog and I hope you enjoyed it! Feel free to leave me a comment and be sure to follow me for future posts about my camera collection. I've always loved Polaroids and I enjoy doing a lot of window shopping for cameras. Anyways, I really enjoyed your blog! Wonderful. One of my goals for this year is to start a vintage camera collection. I just love them so much and, though most of my photos now are shot on digital, I don't want to lose touch with the wonderful world of film. Great post! My grandfather had a Polorid. He loved it. I loved him!